On 10 July 2016, Pakorn, Anan, Anucha, three New Democracy Movement (NDM) activists, and Prachatai journalist Taweesak were taken to Ban Pong police station for allegedly carrying anti-constitution material in car. Later on, Phanuwat, a student from Maejo University, was taken from his residence in Ratchaburi to the police station. They were charged with violating Section 61 paragraph 2 of the Referendum Act, and were detained at the Ban Pong police station. On 11 July 2016, Ratchaburi Provincial Court granted bail to the five for 140,000 baht each. Taweesak “Aof” graduated from faculty of Political Science of Thammasat University in Politics and Governments, currently working as a journalist for Prachatai website, covering news related to activists and human rights. Pakorn “Man” Areekul has been active in opposing the autonomization of Burapha University while studying. He was in a movement against the Amnesty Bill in 2013. After the coup in 2014, he joined the New Democracy Movement. Anucha is an NDM activist. He graduated from College of Interdisciplinary Studies, Thammasat University. Phanuwat is a student from faculty of Political Science, Maejo University, Phrae campus. The five were jointly accused of “having transmitted a text, or an image, or sound through the print media, or radio, or television, or electronic media, or other channels, which are inconsistent with the truth or are violent, aggressive, rude, inciting or threatening and aimed at preventing a voter from casting a ballot or vote in any direction shall be considered as disrupting the referendum”, an offence under Section 61 Paragraph 2 of the 2016 Referendum Act on Draft Constitution. Officials listed 14 confiscated items in the arrest record: a pick-up truck, a vinyl banner writing “Thai PM, everybody gets mocked”, a set of speaker, ‘Vote No’ bookmarks, “7 reasons to reject the draft constitution” leaflets, referendum vote pamphlets, counter opinion leaflets, “Release the 7 referendum prisoners” leaflets, Nitirat group’s statement on the referendum, pamphlets about how to register to vote outside hometown, and ‘Vote No’ stickers. The arresting officials received reports from citizen and Ban Pong police communication center on 10 July 2016 about a Chevrolet pick-up truck carrying items with a circumstance believed to start distributing anti-referendum leaflets in Ban Pong. It was found later that the suspect car parked on Song Phon Road, in Ban Pong municipality. The police officials presented themselves to search the car which belongs to Pakorn with Anucha, Anan, and Taweesak were passengers. The police then took the four to Ban Pong police station. In the same evening, the police took Phanuwat from his residence in Ratchaburi to the police station. Prachatai reported that at 11.30, as Pakorn Areekul, Anucha, and Anan were visiting Ban Pong villlagers who were summoned after opening a referendum watch center and charged with violating the Head of NCPO Order No. 3/2016, the police searched their pick-up truck and found referendum campaign leaflets. The police then invited the three to question at the Ban Pong police station. Taweesak, a journalist for Prachatai who went along in the car to conduct interview, was also questioned. Thai Lawyers for Human Rights reported that the police later confiscated the items and accused the four of “having transmitted a text, or an image, or sound through the print media, or radio, or television, or electronic media, or other channels, which are inconsistent with the truth or are violent, aggressive, rude, inciting or threatening and aimed at preventing a voter from casting a ballot or vote in any direction shall be considered as disrupting the referendum”, an offence under Section 61 Paragraph 2 of the Referendum Act 2016. 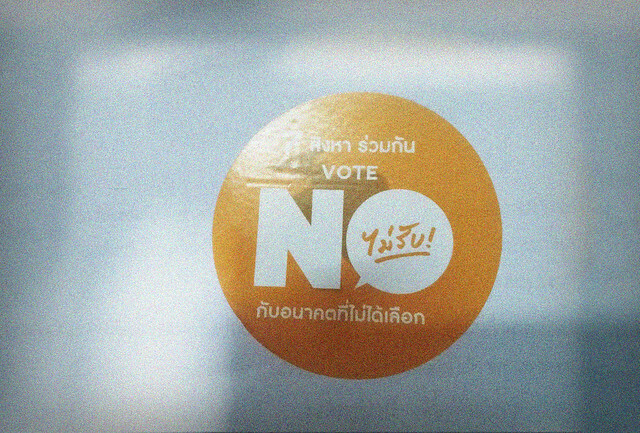 The officials listed 14 confiscated items in the arrest record: a pick-up truck, a vinyl banner writing “Thai PM, everybody gets mocked”, a set of speaker, ‘Vote No’ bookmarks, “7 reasons to reject the draft constitution” leaflets, referendum vote pamphlets, counter opinion leaflets, “Release the 7 referendum prisoners” leaflets, Nitirat group’s statement on the referendum, pamphlets about how to register to vote outside hometown, and ‘Vote No’ stickers. Whichi is a violation of Referendum Act Section 62 paragraph 2. Around 18.00, the police detained the 4 suspects at the detention room in Ban Pong police station, and rejected bail during the investigation by stating that they would conduct the investigation in the same night. The suspects would be brought to seek detention order at Ratchaburi Provincial Court in the morning of 11 July 2016. At 20.20, it was reported that the police sieged Phanuwat’s residence and inform the same charge as the former four. Phanuwat was one of the accused of the opening of the referendum watch center in Ban Pong. Thai PBS website reported that at 9.45, the Ban Pong police brought the 5 suspects to request detention order from Ratchaburi Provincial Court. The inquiry official filed a request for detention order because they need to interrogate 5 more witnesses and were waiting for the result for their criminal record. Taweesak, the Prachatai journalist, insisted on not requesting bail because journalism is not a crime. Prachatai reported that at 16.45, Ratchaburi Provincial Court granted bail to the 5 suspects who possessed referendum leaflets and were believed to distribute the leaflets, and were charged with Section 61 Paragraph 2 of the Referendum Act 2016. The Court granted bail for each of the five for 140,000 baht, 700,000 baht in total. The four activists, some are students, used money from bail funding raised by Anon Nampa, while Taweesak used money from his organization. They were summoned to apepar before the public prosecutor.